What are the products that you prefer to shop online? I think for electronics, there are lots of great deals online, however, we should be careful for scams. When it comes to clothes and accessories, I prefer going to the mall because I would like to make sure that they fit well. How about you? What are the things that you prefer to get online and what are the things that you prefer to buy at the mall? I used to love going to a bookstore to buy books. However I'm starting to prefer buying them online instead. I can find them a lot cheaper online than I can at the bookstore. I don't mind shopping for electronics online either because I can get some good deals. I don't like shopping for shoes or clothes online, I never know if they really fit or not. I think I will buy packed things online, so that i do not need to worry about the quality of the thing I buy. And before I buying thing online, I will check that whether it is easy or not for me to repair the thing, and how to pay for the things. I prefer those pay-after-recieving. Though online shopping can help you buy things in a low price, you have to suffer a greater risk at the same time. i like buying perfumes on line...the site that i go to always have a sale and its so cheap....thats the only one i buy online...the other things i check it on craigslist and meet the seller then buy it if i like it. bags, especially RL or ralph lauren handbag.,just love this brand.,Ü and i go online shopping at ebay.com. i always look for good buys online, i compare prices regarding the products but i never tried buying online. i know there are lots of good things to buy on online store but still i am afraid to take a risk in buying to someplace i never see. Home decor.I love candles, things to make my house more inviting...I also love perfums,so I look for deals on my fav. brands so I can have them for presents.Also I love e-bay...they have everything!!! There are not many things I would buy online because I would be thinking what if they look different or they wouldn't fit or something. The things I would buy more often online would be books and branded skin care items, that way, I usually get what I want and wouldn't be surprised! I don't really buy online much. I might research and compare prices but I don't usually buy. The only things I buy online sometimes are computer programs that are either cheaper or not available close to me. We purchase most electronics online too. And also some furniture (my boys bunkbeds). I'd rather go to the mall and shop for clothes for me so I can try them on. But for my 18month old, i shop mostly online. I just buy some books online because I think other things are unsafe. Haha I would love to buy great deals online! I maybe buy some accessories and maybe even electronic gadgets online but for clothes, the mall is definitely the place for me. It's just different trying something on before buying it. The only things I've ever bought though for now are earrings and beanie babies. lolz! I do hope that'll change this summer. I plan to sell somethings over at ebay. For shopping online, I prefer to buy books and dvd. Just make my life so easy when i do that. Don't have to take bus to town or ask somebody to bring me to the store. but same as you, for clothes, I prefer to go to the stores so I can choose and try to fit in the stores which ones are fit for me. I like to buy my printer inks and some electronical things, it can be very tempting to buy as some companies do have pretty good deals. The only time I get online to shop is for books, movies and cd's I am unable to find in stores. Other than that I go to stores for my shopping needs. I never buy online, really never. Many years ago when I first heard aboput e-bay I was pretty excited about it and I wanted to try it. I wanted to sell first but than my room mate told me her boyfriend had bought a computer on ebay and he got scammed. At the end the police had caught the man who was scamming people, because he didn't do that only to my room mate's boyfriend but to many people but her boyfriend never got back his money nor the compuer he had paid for. So each time I hear about buying online I remember this story and I just don't wanna do it not even when it's about buying from online shops and not people. I pretty much do all of my shopping online. There is always a variety and it helps me to cut down on impulse buying. I have a lot of fun shopping at stores, only when I don't really need anything, LOL. 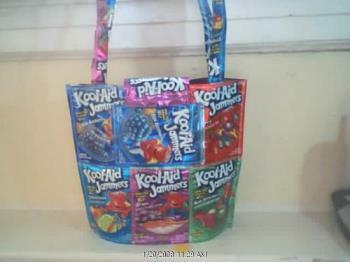 I like buying empty koolaid jammers pouches online. This saves me from having to drink more juice than I want. Plus people are listing the pouches left and right. I like going to the mall to browse the new styles of bags. This gets me going to make more bags at home. It also gets me out of a dry spell I may be having. Since I don't drive I buy just about everything online. Especially at Christmas when I get some great deals on ebay which is my first preference for online shopping. Of course I would prefer going to the malls but I seldom get the chance to.